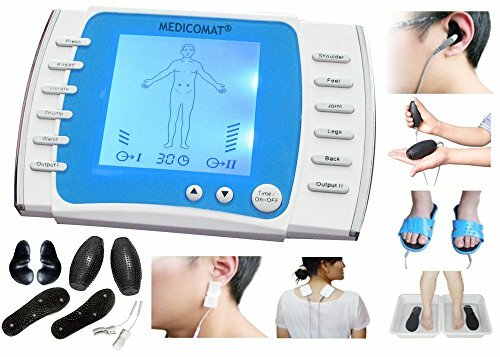 Medicomat® Medical Automat Series * THE WORLD'S BEST HEALTHCARE APPARATUS * Hypertension and Total Therapy Machine * Fully Automatic Treatment at Home * Auto-selection of acupuncture points on the ear. Why is the BEST? * Overall Therapy * 10 Treatment Modes: Press Knead Vibrate Thump Waist Shoulder Feet Joint Legs Back. Easy to Operate * Electricity & Batteries * Screen & Time Set * Voice Guide * 2 x Output for Therapy * Double Effect - You can use them simultaneously and choose two therapies at same time for the better therapeutic effect.